What’s in a name? I have read that Unicoi County got its name from unega or unaka, the Cherokee word for white. With the seasons changing at last, we have enjoyed some beautifully white vistas recently, with fog shrouding the ridges, coves and hollows. State Representative Alf Taylor insisted on the name when he introduced the bill that authorized the creation of the county in 1875. It is obvious that he knew and loved these mountains and valleys. Because of the spelling, some people who call the library from out-of-state try a French pronunciation, but many just hesitate and wait for me to take the lead. “No, actually it’s Cherokee, not French,” I say and then I explain the meaning. It conjures up a pretty picture for them. When I first told my son I was moving here, Andrew thought I said Unicorn County and a few other callers and correspondents have made that same mistake. He thinks the high school mascot should be the unicorn. After reading about the Erwin High School Yellow Jackets in the 1931 Nolichucky high school annual, I know a change of mascot would not be unprecedented. Andrew has to admit, however, that Blue Devils seem much more intimidating than Unicorns. I believe our opponents this season would rather have met a blessing of unicorns than our Blue Devils. Congratulations, team! What’s in a picture? The dust jacket of John Grisham’s latest novel “The Reckoning” shows a kindling sunrise igniting dark blue clouds with swathes of gold and coral. In the rapidly waxing light, cotton fields are punctuated with bare trees and a rustic barn. If you take a closer look you notice another building behind the old barn, which appears to be surmounted by a cross. Is it a church, or could it be a telephone pole rising beyond another old outbuilding? There is not yet enough light to tell. It is October in Clanton, Mississippi; the year is 1946. Early one cold morning, Pete Banning, who is a decorated war veteran and the patriarch of a prominent local family, gets up, confers with his foreman, eats breakfast with his sister, drives into town and shoots and kills his friend and pastor, the Reverend Dexter Bell. No one else is harmed in the incident. All Banning will say about the shocking murder is, “I have nothing to say.” How can his attorney represent a man who won’t say a word in his own defense, even when he knows the consequences if he remains silent? On Saturday, Oct. 20, the Science Hill High School Topper Band hosted the 6th Annual Hilltopper Invitational marching band competition at Kermit Tipton Stadium in Johnson City. This year’s event welcomed 14 high school bands from across East Tennessee and Southwest Virginia. Each band performed a unique show which was scored by a panel of six judges in the areas of Music, Visual Effect, Percussion and Color Guard. Competitors in this year’s Invitational included: Pigeon Forge High School, West Greene High School, Chuckey-Doak High School, Twin Springs High School, Sequoyah High School, Cocke County High School, Unicoi County High School, David Crockett High School, South-Doyle High School, Volunteer High School, Carter High School, Greeneville High School, Cherokee High School and Maryville High School. The Unicoi County High School Marching Blue Devils took home first in Class AA. The band also took first place in both Music and Visual Performance for the small class division. The UCHS percussion also won first in the AA division. The awards ceremony concluded with the announcement of the Hilltopper Invitational’s 2018 Grand Champions. This award is given to the top scoring bands in each of the small band (Classes A and AA combined) and the large band (Class AAA) divisions. The UCHS Blue Devil Band claimed the title of Grand Champion of the small band division. The Maryville High School Red Rebel Band made the trip home as the Grand Champion for the large band division. Winners of this regional competition include the following for First in class: Class A, West Greene and Class AAA, Maryville. Maryville was the first place winner in Music for the large class division, while Volunteer won for Visual. In Percussion, Class winners were West Greene (A) and Volunteer (AAA). In Guard, first place went to Chuckey-Doak (A), Cocke County (AA) and Volunteer (AAA). The competition was funded, in part, by Arts Build Communities, a program funded through the State of Tennessee Specialty License Sales, and administered in cooperation with the Tennessee Arts Commission and First Tennessee Development District. I’ve been so focused on migrating warblers and other songbirds of late that I felt some surprise when outside near dark on Oct. 10 I heard the low hoots of a feathered phantom from the woodlands on the ridge behind my home. Owls have been around for a long time, according to “Owls: The Silent Hunters,” an episode of National Geographic’s series, “Wildlife Wonders.” The narrator for the episode reveals that the first recognizable owls first showed up in the fossil record about 40 million years ago. Since that time, owls have evolved into a fantastic, widespread and diverse group of about 135 different species. North America is home to several species, including the far-ranging great horned owl, which ranks as one of the continent’s largest owls. It’s not the largest owl in North America, but it is the most widespread of the continent’s large owls. The snowy owl — popularized in J.K. Rowling’s fiction as Harry Potter’s loyal companion owl, Hedwig — is one of the largest owls in the Northern Hemisphere, bigger than such large owls as the great horned owl and barred owl. The aptly named great gray owl is larger in body size than the great horned owl, but the snowy owl is heavier and more massive than either of these two contenders. Today’s highlight is our all-day Halloween Bake Sale to benefit the library’s programs for children and teens. Come on down for a yummy treat to prime your sweet tooth for Halloween. Tomorrow night the curtain will rise on the final act of our annual Halloween Film Festival. This film classic spawned two sequels. Join us at 6 p.m. on Thursday, Oct. 25, for popcorn, candy and a movie. Please feel free to bring your favorite soft drink in a spill proof plastic container to complete the theater experience. You may call the library at 743-6533 if you have questions. Young ghoulies and ghosties and long-leggedy beasties and things that go bump in the night are invited to stop by the library for an hour of spooky fun on Halloween night. The party will start at 6 p.m. and end at 7 p.m.
Make plans now to don your most creative costume and join us for kid-friendly ghost stories around the “campfire”, games, activities and refreshments. Please note that we will not be having our normal Wednesday Little Tykes Story Time or Reading Buddies that day so we can devote all of our attention to the Halloween party. What happens when people do all the things society expects of them but they still steadily lose ground? Barbara Kingsolver’s eighth novel “Unsheltered” explores that question and introduces us to the historical figure Mary Treat, one of the women scientists who were never mentioned when I was going to school. Magazine editor Willa Knox and her college professor husband Iano have always worked hard. When her magazine folds and his college closes, they are left with no income and three dependents: Iano’s disabled father, their adult daughter and their son’s newborn infant. Their only asset is a house in Vineland, New Jersey that Willa has inherited. That seeming stroke of luck proves to be a disappointment. The historic house is rapidly disintegrating. Seeking a coal among the ashes, Willa visits the Vineland Historical Society. She hopes the house has enough historical significance to qualify for a grant that would pay to shore up the sagging structure. Vineland, the home of Welch’s grape juice, was founded in 1861 as a teetotal agrarian utopia. After the Civil War, science teacher Thatcher Greenwood moves there with his pretty young wife and her mother and sister. He is shocked to find that his house has been so poorly constructed that it stands in danger of collapse. There he meets Mary Treat, whose opinion about Darwin’s theory of natural selection mirrors his own. This conviction is likely to prove problematic, since his employer is staunchly opposed to Darwin’s views. I took part in the annual Fall Bird Count organized each year by the Elizabethton Bird Club. This year’s Fall Bird Count — the 49th consecutive count conducted by the EBC — was held Saturday, Sept. 29, with 50 observers in 13 parties covering parts of five adjacent counties in Northeast Tennessee. The count is the only fall survey of birds conducted in the entire region. The total of 127 species tallied (plus Empidonax species) represented a slightly higher total than the average of the last 30 years, which stands at 125. The all-time high of 137 species was established in 1993. Compiler Rick Knight noted that two very rare species were found this year: a purple gallinule at Meadowview Golf Course in Kingsport, Tennessee, and a black-legged kittiwake on South Holston Lake in Bristol. The kittiwake was first found on Sept. 27 and lingered long enough to be observed during the count. Shorebird habitat was scarce due to high water levels at most sites, thus only one species was found other than killdeer. Warblers were generally found in low numbers, although 23 species were seen. No migrant sparrows had arrived yet. Blackbirds, too, were scarce. Some regular species were tallied in record high numbers, likely due to the above-average number of field parties. Broad-winged hawks were numerous, part of a notable late flight likely due to unfavorable weather conditions preceding count day. My party included retired Milligan College biology professor Gary Wallace as well as Brookie and Jean Potter. We counted birds in the Elizabethton area around Wilbur Lake, along the Watauga River and on Holston Mountain. We observed two large kettles of migrating raptors during our time on Holston Mountain. The term “kettle” is a collective one for a group of migrating raptors. In more general terms, a kettle can refer to any flock of birds of prey. The term is used only in describing raptors that are soaring or flying. Although a few black vultures and turkey vultures drifted on the warm thermals rising off the slopes of Holston, the majority of the raptors in the two kettles we observed were broad-winged hawks. We ended the day with a total of 41 broad-winged hawks on our list. Later we learned that count participants found an amazing total of 321 individual broad-winged hawks, which represents a new high count for the Fall Bird Count for this species. Southwest Virginia is home to the Mendota Fire Tower Hawk Watch, which has been ongoing for decades on Clinch Mountain. The annual autumn survey is currently supervised by Ron Harrington, a long-time member of the Bristol Bird Club. This has been an exceptional year for this particular hawk’s migration. In a post to the list-serve Bristol-Birds, Mike Sanders of Bristol, Virginia, reported that while talking with Harrington on Sept. 29 at Sugar Hollow Park, they happened to glance skyward and noticed a large flock of hawks passing overhead. One kettle contained an estimated 75 broad-winged hawks. “Just goes to show they can be anywhere migrating, not just up on a mountain top,” Sanders wrote in his email. The broad-winged hawk is known by the scientific name Buteo platypterus. The genus, buteo, includes about two dozen large raptors that are often dominant avian predators in their respective habitats. The species is known for migrating in large flocks every autumn to return to wintering grounds far to the south as far as Mexico and Brazil. The broad-winged hawk’s counterpart in the western United States is Swainson’s hawk, which shares the broad-winged hawk’s inclination for migrating in large flocks. Swainson’s hawk is named for William John Swainson, the famous 19th century English naturalist I mentioned in last week’s column in connection with Swainson’s thrush. “Each autumn, nearly the entire breeding population of the Swainson’s Hawk migrates from the temperate zone of North America to wintering areas in South America,” according to a profile posted at the website Birds of North America. The website notes that those Swainson hawks that migrate out of the prairie region of Canada must undertake a flight of more than 6,200 miles to reach their wintering habitat. They will repeat this long-distance feat again in the spring. This distance places Swainson’s hawk second among raptors only to that of the Arctic Peregrine Falcon. Other raptors in the region include Cooper’s hawk, sharp-shinned hawk, red-tailed hawk and red-shouldered hawk. These raptors feed on everything from rodents and reptiles to various insects, amphibians and songbirds. There’s one hawk, however, that turns to another source of prey. Ospreys, which are also known as fish hawks, have also been prevalent this autumn. I enjoyed watching an osprey perched in a tree along the Watauga River while leading the first of the Saturday October bird walks at Sycamore Shoals State Historic Park in Elizabethton, Tennessee. The osprey put on a great show, stretching its wings and posing for photographs taken by several walk participants. Ospreys migrate through the region in spring and fall, making sightings more likely along lakes and larger rivers. I see them even more often when I travel to South Carolina, where these medium-sized raptors are common along the coast and in wetlands. Actually, any body of water, from river or lake to pond or marsh, can provide adequate habitat for an osprey’s needs. The osprey is the only raptor in North America that feeds almost exclusively on fish. These hawks only rarely turn to other prey, such as rodents, reptiles and amphibians. Ospreys are a conservation success story. According to the North American Breeding Bird Survey, osprey populations grew by 2.5 percent per year from 1966 to 2015. As a result, this large brown and white hawk is common from coast to coast and all points in between. The 27 ospreys detected on the recent Fall Bird Count also set a new record for this species on this particular survey. There are still plenty of ospreys and other birds to see before this fall migration season ends. The remaining Saturday walks at Sycamore Shoals State Historic Park are scheduled for Oct. 20 and Oct. 27. Participants should meet at 8 a.m. in the parking lot in front of the park’s Visitors Center. There is no charge, and the public is welcome. Bring binoculars to increase viewing enjoyment. With fright night only two weeks away, we want to let you know that our teen Halloween party will be held Friday, Oct. 19, from 5:30-7:30 p.m. and our children’s Halloween party will take place on Wednesday, Oct. 31, from 6-7 p.m. Check our Unicoi County Public Library Kids and Teens Facebook page for further details. If you would like to donate a bag of individually wrapped candies for the children’s party Halloween night, we will be happy to accept. We look forward to seeing everybody’s creative costumes. In case you think we adults are being left out, remember that we’ll show the second movie in our Halloween Film Festival on Thursday, Oct. 18, at 6 p.m. These movies were chosen with adults in mind and would not be recommended for young children. That said, these films are part of my personal collection and consequently are not ones I consider likely to give me nightmares. Okay, I admit it: I am a sucker for a well-designed dust jacket. I may not end up buying the book, but I will pick it up and give it my attention for at least a minute to find out whether the plot is as promising as the artwork. Of all the volumes in our last order, the hands-down winner in the book-by-its-cover department was Rena Rossner’s “The Sisters of the Winter Wood.” The art reminds me of a gilded Black Forest woodcarving set off to perfection by a background of dark chocolate. The composition is grounded by a swan and a bear and surmounted by a rustic crown, so readers of fantasies are already alert to the possibilities. In the vast reaches of the Russian empire, sisters Liba and Laya have been reared in a secluded village surrounded by forests. It is the kind of place where mothers urge their daughters to be wary of strangers, but there may be more to Mami’s warning than just ordinary caution. After all, the cover promises “Every family has a secret…” and the girls do not yet know theirs. Sisters in fairy tales are often quite different, like Snow-White and Rose-Red. Liba and Laya are no exception. The differences between the sisters are underscored by the alternating chapters of the book. Liba’s are written in prose and Laya’s in blank verse. Although the girls are devoted to one another and their parents, their heritage may prove to be their greatest challenge. If you like fairy tales or have enjoyed Katherine Arden’s “Winternight Trilogy,” this book is likely to appeal to you. And in case you’re wondering, “The Winter of the Witch,” the third book in Arden’s series, is due to be released on Jan. 8. How timely! While many migrant birds take wing in the autumn, a recent event reminded me that, in many respects, fall is the season of the thrush. Taking part in the recent Fall Bird Count conducted by members of the Elizabethton Bird Club afforded me the opportunity to see some amazing birds, including large flocks of migrating broad-winged hawks, playful pileated woodpeckers and some often hard-to-see thrushes. I usually feel lucky to be able to find one thrush in a single day of birding. On Saturday, Sept. 29, migration must have brought these birds out in full force, because I saw three different species — wood, gray-cheeked and Swainson’s — in the span of a few hours. I found the Swainson’s thrush during the morning while walking the trails at Sycamore Shoals State Historic Park along the Watauga River in Elizabethton, Tennessee. I flushed the bird from cover and got a good look at the bird. The Swainson’s thrush is a model of subtle beauty with a plumage that consists of warm olives and browns and a beige wash across the upper half of an otherwise white breast dotted with faint brown spots. The beige wash extends into a prominent eye-ring. I usually see more Swainson’s thrushes in autumn than spring. Named for William John Swainson, the thrush doesn’t spend the summer months in the region, but is a fairly common spring and fall migrant. The thrushes that do nest during the summer in the region include wood thrush and veery, as well as the hermit thrush, which is also a winter resident. The namesake of the Swainson’s thrush was a famous English naturalist living in the 19th century. Swainson, who grew up in London but spent much of his adult life in New Zealand, excelled as an English ornithologist, malacologist, conchologist, entomologist and artist. Besides the thrush, eight other species of birds are named in his honor. Two of the other birds — Swainson’s warbler and Swainson’s hawk — are resident in the United States for at least the spring and summer months. The other six species include Swainson’s francolin, Swainson’s sparrow, Swainson’s antcatcher, Swainson’s fire-eye, Swainson’s flycatcher and Swainson’s toucan. Swainson never visited the United States of America, but in 1806 he accompanied the English explorer Henry Koster to Brazil in South America. Swainson and his family emigrated to New Zealand in 1841. Swainson settled near the New Zealand city of Wellington only to have earthquakes in 1848 and 1855 devastate the shoreline near his estate, which he called Hawkshead. He found the pioneer life in New Zealand difficult, especially when a native Maori chief pushed his own claims to Swainson’s estate. Swainson died of bronchitis on Dec. 6, 1855, at the age of 66. The recent Fall Bird Count also offered me an opportunity to see a gray-cheeked thrush for the first time in almost 18 years. The species is aptly named. The gray-cheeked thrush lacks an eye ring, and its most prominent feature is the grayish plumage around the bird’s face. No evidence of brown or buff coloration intrude into the face region. Gray-cheeked thrushes nest far from Tennessee and Virginia. In fact, they nest almost to the very edge of the tundra region in the far north. Because of this tendency to nest in remote regions, experts have had difficulty determining population trends for this species. I know that I hadn’t seen one of these thrushes since back in 2000. I didn’t get a very good look during my recent encounter. I saw a bird fly from a tree branch into thicker cover. I relied on other members of the count party who got a better look to make the identification. The gray-cheeked thrush is not a common migrant in the region, but they do make some sporadic appearances. It’s possible they are also overlooked. Their migration actually takes place at night. The daytime observations of this bird involve individuals that have stopped for a brief respite to refuel and rest. A shy personality contributes to the ease with which the bird can be missed even by a sharp-eyed observer. Like some of its relatives, but perhaps even more so, the gray-cheeked thrush would rather slip into concealing cover than reveal itself on an exposed perch to human observers. Both the gray-cheeked thrush and Swainson’s thrush belong to the genus Catharus, a term derived from Ancient Greek that can be described as “pure” or “clean” in reference to the plumage of some of the members of the genus. The other two Catharus thrushes in North America include the veery, Bicknell’s thrush and hermit thrush. Some members of this genus are colorful birds with descriptive names, including the orange-billed nightingale-thrush, black-headed nightingale-thrush and slaty-backed nightingale-thrush. The incorporation of the name “nightingale” is no accident. Like the famous nightingale of folklore and fairytales, many members of the genus are remarkable singers capable of producing ethereal and flute-like songs. In the final days of September and early days of October, wood thrushes returned to prominence in the woodlands around my home. I have wood thrushes nesting in the woods around my home every spring, but it is still always a treat to see the largest of the brown thrushes that call North America home during at least half of the year. The wood thrush is not a member of the Catharus genus of thrushes, but instead is the sole representative of the genus Hylocichla. While not exactly an official state bird, the District of Columbia has made the wood thrush its official bird. The popularity of the wood thrush is probably helped by its own beautiful song, which has often been described as one of the most beautiful of all North America’s birds. Widespread in the United States and Canada during the summer nesting season, wood thrushes withdraw in winter to spend the cold season in southern Mexico through to Panama in Central America. Right now, migration of thrushes is proceeding at a somewhat leisurely pace. Soon, though, most of this family of talented singers will depart the borders of the United States until next spring. When they get ready to leave, most thrushes will make a remarkable non-stop journey that will take them to the region where they will wait out the cold winter months. Enjoy them before they depart. The start of the fall season has been unseasonably warm this year. It was good news for the Apple Festival, but now I’m more than ready for crisp mornings, autumn color and falling leaves. Our annual Halloween Film Festival should help me get in the mood for the coming chill. If you like movies about monsters without all of that excessive blood and gore, join us at 6 p.m. on Thursday, Oct. 11, for a classic movie suitable to the season. The festival will continue at the same time on Thursday, Oct. 18, and Thursday, Oct. 25. The site license that permits us to show movies within the library prohibits us from advertising them by title or studio outside our facility. This is the eighth year of our Halloween Film Festival. As usual, we chose movies that we haven’t shown before. A listing of the movies is posted inside the library, or you can enjoy the surprise. We will be serving Halloween candy and popcorn. Just bring your own soft drink or water in a spill-proof plastic container. What I can say about our first movie is that it is listed by the National Film Registry as a film worthy of preservation. It also is one of the most highly rated films of the horror genre on IMDb, the Internet Movie Database. Unlike the classic Frankenstein, Wolf Man and Dracula movies, it’s one that most people haven’t seen. When I was young, my mother, younger brothers and I used to watch the “Friday Night Fright” flicks every weekend while my father slept. Even though I watched a lot of horror classics back then, I never saw this one until 13 years ago. If you are curious, join us tomorrow night and see for yourself. I would be interested to hear your opinion of it. Kiersten White’s “The Dark Descent of Elizabeth Frankenstein” retells Mary Shelley’s classic from the point of view of Dr. Frankenstein’s wife Elizabeth. An orphan who was abused by her caregiver, Elizabeth Lavenza is taken into the Frankenstein home as a companion to Victor, a brilliant but volatile child. Victor soon becomes attached to her and she learns to manage his violent outbursts. As she makes herself indispensable to the family’s comfort, she is given the best of everything. After Victor leaves to study at the university in Ingolstadt, he stops writing home. Knowing that her position in the family depends on her usefulness to them, Elizabeth and a friend seek him out and discover what he has been doing with his talents. The publication of this book has been timed to coincide with the 200th anniversary of Mary Shelley’s original gothic masterpiece. Don’t blame Wilson too harshly for the mistake. Even after he “discovered” the first Tennessee warblers back in 1811, it would be almost another century before scientists finally located the bird’s nesting grounds in Canada in 1901. The remote and inaccessible nature of the region helped prolong this mystery about the Tennessee warbler’s life cycle. Some experts have floated the opinion that the Tennessee warbler should be named “coffee warbler,” since wintering individuals are attracted to coffee plantations in Central America. According to the website, “Birds of North America,” recent studies demonstrate the importance of shade coffee plantations for Tennessee warblers during their time spent outside North America every winter. Other warblers, such as the black-throated blue warbler, are also closely associated with coffee plantations during the wintering season. The Tennessee warbler is not strictly an eater of caterpillars and insects. This warbler has a bit of a sweet tooth — or should that be sweet beak? They visit flowers to partake of nectar; however, the Tennessee warbler is not a good example of an avian pollinator. Tennessee warblers cheat by poking holes in the flower with their bills to steal the nectar without having to let the flower’s pollen accumulate on their bills and heads. The Tennessee warbler will also come to sugar water feeders put out on their wintering grounds to attract hummingbirds. The Tennessee warbler also supplements its diet with fruit and berries. While the briefly visiting Tennessee Warbler already pays tribute to our state with its common name, the Northern mockingbird was selected in 1933 as the official bird for Tennessee. This relative of the brown thrasher and gray catbird also serves as the state bird for Arkansas, Florida, Mississippi and Texas. At my home, Northern mockingbirds are usually evident only during the winter months. I haven’t seen one at home so far this year. Gray catbirds were scarce this summer, but a pair of brown thrashers provided much entertainment as they raised young in my yard and gardens. I will be conducting morning bird walks at Sycamore Shoals State Historic Park in Elizabethton every Saturday in October. Walks begin at 8 a.m. from the parking lot at the park’s visitors center. The walks are free and open to the public. Bring a pair of binoculars to increase viewing enjoyment as participants scan for warblers and other migrants visiting the park. Email me at ahoodedwarbler@aol.com for more information. I have been a good girl for the past year, considering each calorie and counting every carb, but I am ready for an Apple Festival splurge. Bring on the fried apple pies! Don’t forget the apple butter, and if there’s an apple cake baking somewhere out there, put my name on it. The Unicoi County Apple Festival means a little extra work for residents, but a lot of extra fun. As we usually are, the library will be open on both days of the Apple Festival. Although several of the everyday access streets will be blocked by vendors, your library will still be available. Just take Elm Avenue south past Love Street and Erwin Utilities to Iona Street. Turn right at Iona and cross over Main Avenue to Nolichucky Avenue. Turn right at Nolichucky. The Unicoi County Public Library will be on your left in our beautiful and historic old depot building. Park and Shop at the Library! The parking spaces in front of our main door will be reserved for those patrons who are using the library. There is no charge for parking while you are using our facility or shopping at our book sale. For those who want to attend the festival, convenient parking will be available in the library parking lot on Friday or Saturday for a donation of $5. All funds raised will help support library programs. Festival parking will begin at 8 a.m. on Friday and Saturday. Business hours will be the same as usual. The library will be open from 10 a.m. to 6 p.m. on Friday, and from 11 a.m. to 3 p.m. on Saturday. Our basement book sale will be open during our regular business hours on Friday and Saturday. We have thousands of used books for you to browse, so most book lovers are bound to come across one or two diamonds in the rough. Or ten, if you are anything like me! The library will be closed on Monday, Oct. 8, in observance of the Columbus Day holiday. No items will be due on that date. Books may be deposited in our book drops whenever we are closed. They are located at the library in Erwin and at Town Hall in Unicoi. Our annual Halloween Film Festival will begin Thursday, Oct. 11, with a classic movie chosen to send a shiver up your spine. Just bring a bottle of your favorite soft drink and join us at 6 p.m. for popcorn, candy and a movie. Please call the library at 743-6533 if you would like more information about any of our programs. In the wake of flooding from Hurricane Florence, consumers shopping for a vehicle should be aware that flood-damaged cars and trucks from the Carolinas will eventually surface in Tennessee. To raise awareness, the Tennessee Motor Vehicle Commission, which is part of the Tennessee Department of Commerce and Insurance’s (TDCI) Regulatory Boards division, is warning consumers to be on alert for scammers who might disguise severely water-damaged vehicles as being perfectly good. The Motor Vehicle Anti-Theft Act of 1996 makes a clear distinction between a “freshwater flood” vehicle (which can be rebuilt) and a “saltwater damaged” vehicle (which cannot be rebuilt). Tennessee titling laws, administered by the Tennessee Department of Revenue, distinguish between “non-repairable” and “salvage” vehicles by the type and extent of the damage. The determination about the type and extent of damage is made by the insurance company. Many of the vehicles damaged by Hurricane Florence’s torrential flooding will be categorized as saltwater damage due to the presence of “brackish water,” a mixture of salt and fresh water that is generally the result of the backwash of saltwater into bayou areas. Saltwater damage continues to corrode and eat away at a vehicle’s body and operating components, even after it is cleaned up and repaired. With the computer system of today’s motor vehicles commonly located in the lower quadrant of the car, even low water levels of water damage can cause damage to a vehicle’s electrical system. A vehicle that has been declared a total loss due to saltwater damage is deemed “nonrepairable” and may never be titled again in the state of Tennessee. Saltwater damaged vehicles can only be dismantled and used for parts. Scammers will take advantage of the fact that no national standard or law pertaining to various title brands exists. They will move water-damaged vehicles to a state with different laws or standards, giving them a “clean title.” Typically, there is an influx of water or saltwater damaged vehicles seen at parking lots and on social media sites following an occurrence such as a hurricane or flood. Scammers typically attempt to sell flooded vehicles quickly after a disaster, hoping to stay ahead of computer system updates so that title check systems don’t have time to detect the car’s history. By the time a consumer discovers the vehicle’s history, the seller will be long gone. Prior to the sale of the vehicle, any person selling a flood vehicle is required by law to disclose such history to the purchaser. Further, once titling that vehicle, the purchaser will receive a branded vehicle title indicating the vehicle’s salvage history. Having such a title will substantially impact the value of that vehicle for further resale. Anyone attempting to purchase a vehicle in the near future should be on the lookout for indicators of a flood vehicle, such as a musty smell, damp carpets, or mud/silt under the seats, and should attempt to find the vehicle history prior to purchasing. Use a reputable title check service, such as the National Motor Vehicle Title Information System, to check the vehicle history. If you find that it was last titled in a flood-damaged area, you should ask a lot of questions before making a decision. Keep in mind that title check companies are only as good as the information that they collect from other sources. Some of the sources that they collect data from may be delayed in pushing their data to the system. Remember that a vehicle’s flood history may take up to 30 days or longer to post on traditional consumer reporting sites. As such, the Commission recommends that individuals purchase motor vehicles from a licensed motor vehicle dealer, which they can verify at http://verify.tn.gov/. Because the vehicle could appear to be in very good shape, even if it has significant electrical and corrosion issues, it’s important to always have a trusted mechanic inspect a vehicle before purchasing it. Be aware that there will be many recreational and powersport-type vehicles that have been damaged as a result of the recent storms as well. Look for the signs of flooding and saltwater damage before purchasing these units, too. Keep in mind that there are lawful ways of reselling previously damaged vehicles. “Salvaged vehicles” can be repaired and sold as “Rebuilt vehicles” so long as they comply with the applicable laws. The Motor Vehicle Commission requires that licensed dealers provide a disclosure of the vehicle’s history as previously been a “Salvaged vehicle” on a Commission approved form. “Saltwater damaged” vehicles are non-repairable but can be dismantled and the parts can be sold lawfully through a licensed dismantler/recycler. If you suspect a licensed dealer* has sold you a vehicle with a salvage history and failed to disclose it, you may file a complaint here. The Commission is not responsible for collecting or enforcing any refunds from unscrupulous sales but may take disciplinary action resulting in potential civil penalties or suspension or revocation of a dealer’s license. Visit the Tennessee Motor Vehicle Commission online or by calling 615-741-2711. *Please note that the Commission does not have authority over vehicle sales transactions between individuals. In those matters, consumers will need to contact their personal attorney for possible remedies. About the Tennessee Department of Commerce & Insurance: TDCI is charged with protecting the interests of consumers while providing fair, efficient oversight and a level field of competition for a broad array of industries and professionals doing business in Tennessee. Our divisions include the Athletic Commission, Consumer Affairs, Tennessee Corrections Institute, Emergency Communications Board, Fire Prevention, Insurance, Tennessee Law Enforcement Training Academy, Peace Officers Standards and Training, Regulatory Boards, Securities, and TennCare Oversight. On Friday, Sept. 28, the Unicoi County Sheriff’s Department issued a scam warning to citizens. According to the press release, a group of individuals is calling Unicoi County citizens in an attempt to scam money from them. Recently this group was able to acquire $8,000 from a senior citizen living in the county. Sheriff Mike Hensley reports that this group will call on the phone and say that someone known by you is in jail or in trouble out of town. They will represent themselves to be law enforcement or a lawyer. This group will give instructions on how to send money to get this loved one out of jail. This could include various gift cards, credit cards or cash advance checks or Western Union transactions. If someone calls on the phone requesting that money be sent, you should automatically assume it is a scam. The sheriff also advised that anyone who receives one of these calls and feels compelled to send money should contact his office first. “We will assist anyone to verify if a loved one or acquaintance is incarcerated anywhere in the country,” Hensley said. ember advancing on the calendar, I have been keeping an eye on the skies. For the most part, I focus on the upper branches of trees and feeders during the migration season, but I don’t forget the need to look skyward from time to time. So, keep looking skyward. The next flock of migrating common nighthawks may fly over your home. These flocks are usually on the move throughout September although they begin to appear as early as late August. They can also appear almost magically, as if out of thin air. First, observers may see one of two birds, then several, followed quickly by dozens or sometimes hundreds as they wheel and cavort in the skies overhead with impressive grace and agility. I’ve seen flocks that would easily number more than 500 birds in locations throughout the region, although flocks often number only a couple of dozen birds. The two flocks I’ve observed so far this migration season numbered about 30 and 50 birds, respectively. There will be an author meet-and-greet and signing event at the Unicoi County Public Library on Saturday, Sept. 29, at 1 p.m., featuring authors from the Unicoi County High School Creative Writing Club. The club formed last school year and published its debut anthology, a collection of short stories titled “OUT OF THE BLUE,” on Sept. 4. The anthology features contemporary stories “Eulogy” by Devon P. Hubbard, “The Beekeeper’s Son” by Kate Hollenbeck, and “No Substitute” by Katlyn Higgins. Speculative fiction tales in the anthology include “Sans Fin” by Katye Beard, “Last Words” by Bryce S. Calain, and “Full Moon Nights” by Charmayne L. King. Ashley Nichole Edwards and Laura Birchfield contributed two essays to the project – “Auschwitz: Unknown to Us” and “Pretty Hurts,” respectively. Club sponsors Amy N. Edwards and Dustin Street also have stories published in the collection. Edwards’s “Screaming” is a paranormal historical fiction piece, and Street’s allegorical “Kimatí” is a speculative tale. The authors will present a panel and Q&A session at the event, and will also read excerpts from their stories. Attendees will have a chance to purchase a copy at the library, and may have their books signed and personalized by the authors in attendance. The club will also accept donations toward a field trip they plan to take in November to see best-selling author Courtney Stevens (“Faking Normal”; “Dress Codes for Small Towns”). Stevens has also agreed to come to the high school and present workshops for the club later in the year. “OUT OF THE BLUE” is available in paperback and e-book versions on Amazon. All proceeds on the sale of the book will benefit the UCHS Creative Writing Club as it endeavors to teach new club members the ins and outs of writing and publishing in today’s marketplace. For more information, please visit www.uchsonline.com/write, or contact Edwards or Street at 743-1632. Although some authors of novels are not known for a particular genre, most veteran writers eventually become associated with thrillers, romance, historical fiction, fantasy or some other category of fiction in which they specialize. If we who catalog and categorize novels for our patrons become complacent, we could make mistakes. After writing 43 New York Times bestselling novels, romance author Jude Deveraux has penned her first mystery, “A Willing Murder.” The title, thank goodness, alerted us to verify the genre. Murder simply isn’t romantic. Like the writer who created her, Deveraux’s protagonist Sara Medlar is a romance author. Retired after selling millions of books, Sara moves back to her hometown of Lachlan, Florida, and takes on the stately home she admired as a child. The venerable mansion is in desperate need of remodeling and much too big for Sara alone. When her niece Kate is offered a job in Lachlan, she asks Sara if she can stay there with her until she gets on her feet. Sara agrees, so Kate moves in, suddenly to discover that she is not Sara’s only houseguest. Kate has to admit that Jackson Wyatt is handsome – even charming – but she finds him almost unbearably irritating. It looks as though Jack’s presence may prove too high a “rent” for Kate to pay, until two skeletons are unearthed and the trio find themselves working together to solve the mystery. I wonder whether the flaming red flowers of the royal poinciana tree on the book’s dust jacket have anything to do with the mystery. Since the dust jacket states that the book is “A Medlar Mystery,” I presume more are to come. Of course I may be wrong, but I do suspect the mystery will be leavened with at least a dash of romance. That showy poinciana commanded my notice and piqued my curiosity. I didn’t know what it was, so I simply googled “Florida tree red flowers” and had my answer, with photographs and a list of vendors offering the plants for sale. They are akin to our mimosas, but less tolerant of cold weather. I love the Internet! I no longer sit around wondering about things: I look them up, several times each day. You can, too, and if you don’t already know how, we can teach you. It’s not only easy, it’s fun! We are offering a free “Computer Skills for Beginners” class on Thursday, Sept. 27. Join us here at the library at 6 p.m. to learn what you can do and how you can do it. The session is scheduled to last for about 90 minutes. Since the number of computers we have available is limited, please call the library at 743-6533 to reserve your place in the class. Consider the way the mantis makes a perfect predator. Its spiky forelimbs are spiky and serrated, making them perfect for seizing and grasping. This insect’s triangular head can turn their heads 180 degrees to scan its surroundings with two large compound eyes. 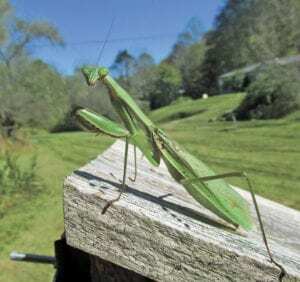 A mantis also has three other simple eyes to increase its keen vision. Brutal mouthparts can easily tear apart and devour any prey the mantis manages to catch with its ambush hunting style. For many birds, fall migration is well underway. The first hints of fall migration are being reported by area birders who have reported sightings of everything from egrets and terns to warblers and shorebirds. I got my first indication of migration on Aug. 27 when I observed an American redstart, black-throated green warbler and black-and-white warbler in my yard. The yearly rush to return to the tropics is a true natural phenomenon among birds such as the broad-winged hawk. Hundreds if not thousands of these raptors will pass through the region at points like the abandoned fire tower on Clinch Mountain near Mendota, Virginia. Records on migrating raptors have been kept at this location since 1958. The broad-winged hawk, a raptor found in the region during the summer, makes a migration flight back to South America every fall that astonishes human onlookers who gather along mountain peaks to witness the spectacle. The hawks form large flocks, also called kettles, that can number in the thousands. The broad-winged hawk belongs to the genus Buteo, which includes such related raptors as the red-shouldered hawk, rough-legged hawk and red-tailed hawk. In Europe, members of this genus of hawks are often called “buzzards,” a term that came over with early settlers in North America. To this day, many people still refer to any large, soaring bird as a buzzard. Many birds migrate out of the tropics each spring to avoid competition from numerous relatives. Others find North America a land of abundant, albeit temporary, resources. This land of plenty offers a wealth of insects, seeds, fruit and other nourishing, nutritious food to help parent birds keep their strength while they work to ensure their young thrive. The phenomenon of migration isn’t exclusive to the neotropical migrants of the New World. Birds in other parts of the world migrate, too. Migration isn’t even exclusive to our fine feathered friends. Many creatures, from wildebeest and caribou to dragonflies and butterflies, impress humans with their endurance as they stage seasonal migrations. The Arctic tern takes the practice of migration to extremes. This small seabird travels each year from its Arctic nesting grounds to the Antarctic region, where it spends the winter months. Put into terms of mileage, the Arctic tern can travel about 50,000 miles in a single year. For a bird with a body length of about 15 inches and a wingspan of about 28 inches, this incredible migration is an astonishing feat. While its migration does not normally bring Arctic terns close to the region, some of this bird’s relatives do offer viewing opportunities for area birders during fall migration. Black terns have been making stops at ponds, rivers and lakes in the region for the past few weeks. This small terns nests on large bodies of fresh water in the interior of the United States and Canada. During the summer nesting season, adult black terns have a black head and body, but the wings are dark gray. By autumn, these terns show an almost entirely white plumage with some darker accents making them similar to other small terns such as Forster’s tern and common tern. The ruby-throated hummingbird, a favorite of many bird enthusiasts living in the eastern United States, makes an impressive migration each year. Just to reach the United States, these tiny birds undertake a strenuous journey. They leave their wintering grounds in Central America to return to the United States and Canada for the nesting season. Most of these tiny birds, which are barely four inches long, make a non-stop flight of more than 500 miles across the Gulf of Mexico. The journey can take almost an entire day! However, the ruby-throated hummingbird is not the champion of long-distance migration among hummingbirds. That accolade goes to the rufous hummingbird, which spends the nesting season in western North America, ranging from southern Mexico to as far north as Alaska and Canada. Its migration journey of almost 4,000 miles is made in stages over the course of a few months. Like ruby-throated hummingbirds in the eastern half of North America, rufous hummingbirds require extra energy to successfully complete such a lengthy migration. They pig out on flower nectar, sugar water mixtures at feeders, and tiny insects to ensure they have the reserves to reach their destinations. Shorebirds, which in North America can consist of birds ranging from turnstones and sandpipers to willets and avocets, are champion migrants. For instance, the bar-tailed godwit makes an impressive non-stop migratory flight. This shorebird nests in parts of Scandinavia, northern Asia and Alaska. Some of these godwits make a nine-day, non-stop migratory flight that takes them from New Zealand to the Yellow Sea of China, a distance of almost 6,000 miles. Needless to say, since the godwits make no stops along the way, they must also go without food for the duration of their journey. Most of the warblers that nest in North America retreat to Central and South America during the winter months. Few warblers, however, make as great a journey as the blackpoll warbler. Instead of migrating over land, this five-inch-long warbler undertakes a two-stage migration. The first half of the migration is a non-stop flight of about 1,500 miles. Every fall, these tiny birds fly over the ocean during this part of their migration, departing from Canada or the northern United States and not stopping until they reach various locations in the Caribbean. There they will spend some time recovering from the exhausting first half of their journey before they continue on their way to such South American countries as Colombia and Venezuela. Once again, during the time they spend flying over open ocean, these tiny warblers do not feed. Even birds that cannot fly undertake migrations. For instance, the Adélie penguins of the Ross Sea in the Antarctic travel about 8,000-10,900 miles annually to their breeding colonies. Of course, they migrate by swimming, not flying, these long distances. The Australian emu, a smaller relative of the ostrich, makes seasonal migrations on foot to ensure access to abundant food supplies at all seasons. Most of our favorite summer birds — scarlet tanagers, Baltimore orioles, ruby-throated hummingbirds, gray catbirds — will make an exodus in the coming weeks. Even as some of our beloved favorites depart, we can take some cheer in the knowledge they will be replaced by some welcome winter residents, including dark-eyed juncos, white-crowned sparrows, brown creepers and yellow-rumped warblers. Fall is indeed a time of departure for many birds, but it’s also a time to make new friends with the other birds that should soon start arriving in our yards and gardens by mid-October. Keep alert to the changing of the guard. The mix of bird species in your yard will change dramatically from day to day for the next couple of months. It’s a time bound to yield some surprises. Zeiger’s Friday program, “Zen and the Art of Mushroom Hunting,” will get underway at 7:30 p.m. following a catered dinner at 6:30. Zeiger has been studying mushrooms in the region for 23 years. She considers herself more of a mushroom enthusiast than an expert. She is a member of the North American Mycological Association and attends their national forays. She is involved in the association’s annual Wildacres foray in the Blue Ridge Mountains near Mount Mitchell in North Carolina. Her program will focus on the two basic approaches — looking for good edibles and scientific study — to mushroom hunting. Her talk will touch on both approaches and include basic information on common mushrooms found in the area, species diversity and poisonous versus edible mushrooms. The program will include various types of fungi from gilled mushrooms, boletes, corals, stinkhorns and polypores, as well as the roles that they play in the environment such as decomposition and forest ecology. She will also talk about what mycologists do at forays. Findings will be included regarding 20 years of record keeping at Roan Mountain and scientific information on studies at Mount Mitchell regarding the amount of rainfall and diversity of fruiting.